I honestly feel like i’m doing something wrong. River is 14 months old and his sleeping is so up and down. I get weeks of him sleeping well, and then all of a sudden it goes down hill again. Its so frustrating, i just wonder what i’m doing wrong. In my head i know it’s probably nothing to do with me, he’s probably teething (aren’t they always) or going through a growth spurt, either way i just can’t help but feel a sense of guilt or a small amount of mummy failure. Someone recommended the Tizzy Hall book “Save our Sleep” to me and i started to follow her routines from around 8 weeks, by 10 weeks River was sleeping from 7pm till 7am, it was absolute bliss and i had this feeling of accomplishment, i was totally nailing this motherhood thing. Then the 4 month growth spurt hit, it shook my confidence a bit and he was back to waking around 2 times a night. That lasted for a very long 3 weeks or so, then his sleeping went right back to normal again, which was awesome. Tizzy’s routine’s include a dream feed at around 10pm, i did this with River and it worked well. I’d actually leant the book to a girlfriend so i never read the part about how to wean them off it or when to do so. I just went cold turkey after River started sleeping back through after the 4 month growth spurt. Then the 6 months growth spurt hit and his sleeping went back to crap again, that one lasted about 3 weeks to a month again and each time his sleeping went back down hill i would start the dream feed again in the hopes it would help him sleep back through, eventually he did and this would be the pattern right up un till this very day. Since River’s birthday in July he’s had 2 periods of not sleeping well and by not sleeping well i mean he’s waking at least once. 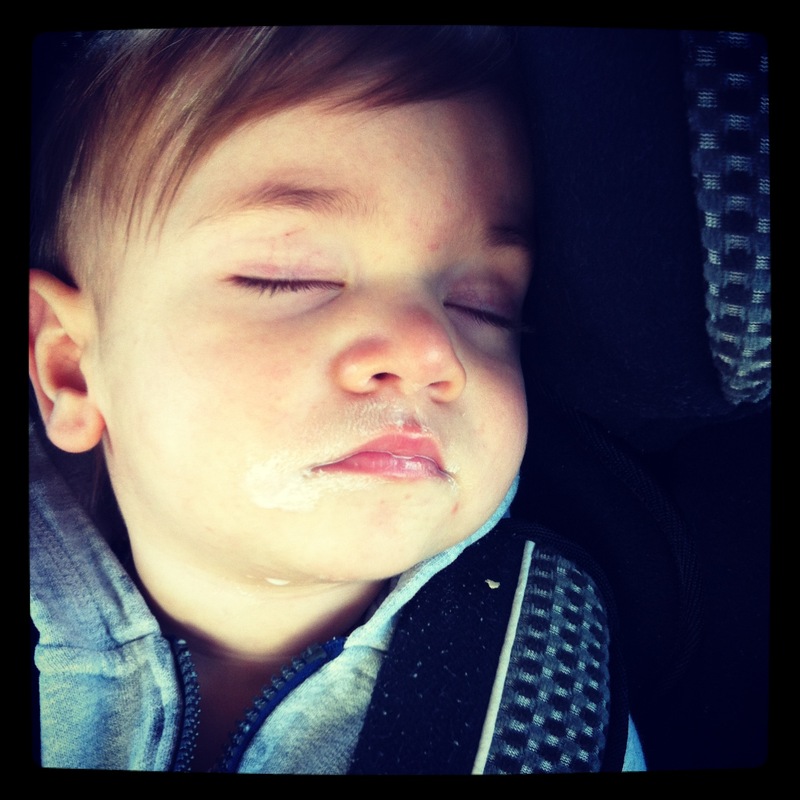 When he turned one and i switched him to cow’s milk he slept through for nearly 2 weeks which was then swiftly followed by 3 weeks of the worst sleep he’s had in ages. Turns out he cut a molar and i also think the cows milk was upsetting his tummy as he was super spewy. I switched to A2 and within 2-3 days his personality changed 10 fold and i had my old happy baby back, he’s sleeping also turned around again to. For nearly another 2 weeks he was sleeping through, now when i say he was sleeping through, i was giving him a dream feed at about 10pm before i went to bed and he was waking up at about 5-5:30am. Like i said, that lasted for about 2 weeks and for probably the last week and a half he’s been waking up again. I’m just so tired and i don’t know what else i should do. Last night i thought, that’s it, maybe he’s just getting to used to waking up and getting a bottle, so if he wakes up i’ll just let him whinge for a bit, i also didn’t give him the dream feed either. Well, i was woken up at 11:15pm, then 1am then 4:30am, i caved in each time and gave him a little bottle. When you’re so tired it’s very easy to just give in and give them a bottle, i just wanted to stop the whinging and get back to sleep. Mumma’s i need help, i need either advice or to know i’m not alone, because at the moment i feel like River is the only 14 month old who is still waking through the night, apparently everyone else’s babies sleep through, what the hell do i have to do for bloody 6hrs of consecutive sleep? See, i’m not even being greedy and saying 8hrs, i’m that desperate, i’ll take the 6 thanks! We finally have a walker! 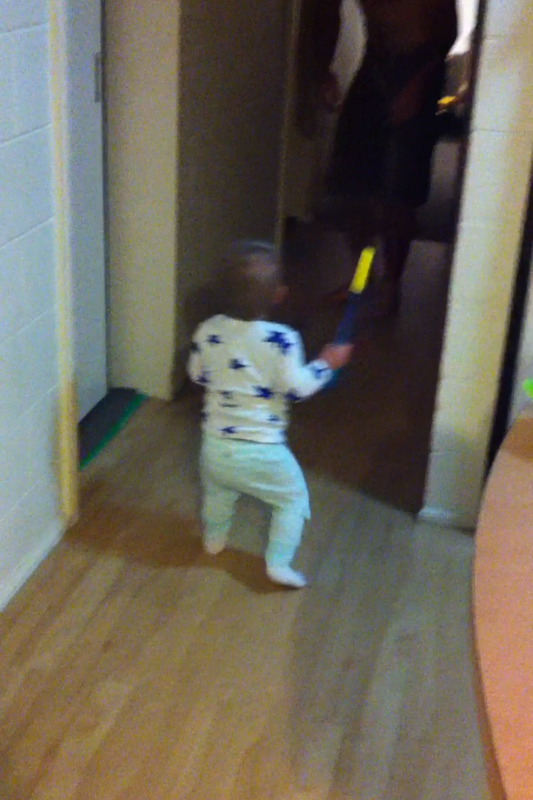 River took his first steps at 11 months. We were at my parents house, mum was sitting on the ground and i was walking with River in front of me holding both his little hands, we walked towards mum and just as we got close, i let go, it was at that moment he took his first ever wobbly steps, before gently falling into his nanny. It was a seriously proud moment, we clapped and cheered like mad men, everyone assured me it wouldn’t be long and he’d be running circles around me and then of course i’d be sorry i’d ever wished for him to be on 2 legs! To be honest, there was a little mummy competition going on in my head, i hoped he would be walking soon because some of his little mates were nearly there and they were younger then him! I know, i know, babies develop at different stages and each babies different blah blah blah well of course i wanted my little River to do it first! (joking…but sort of not joking) haha! Well, turns out he wasn’t the first of his little baby friends, he wasn’t even the second! I was lucky to get 2 steps out of him before he’d just lower back down and start crawling again. As time went by, i noticed he took the most steps when he wasn’t thinking about it. If he was just standing there and suddenly thought, “hey i must have that squeaky giraffe toy over there”, and just went for it, we could get 5 or 6 steps out of him, then we’d all clap and carry on, he’d realise what he had done and gently lower himself back down and start crawling again. Does it make me a pushy parent if it kind of frustrated me a little when he would lower himself back down to crawl after just walking? I would say to him, ” You were just walking, don’t you know how much faster it will be if you just walked?” But he was all like, “mum, i’m a baby, just let me do my thing”…so i did, i got over it, i just let him do his thing. Over the past week River has jumped it up a notch in the walking stakes, i can’t believe how in just one week, River has gone from taking about 4 steps every now and then to full on walking. Today i think i saw him crawl twice, he falls down and instead of staying down and crawling, he dust’s himself off, gets up and starts walking again, my clever little man. So about 2 months after he took his first ever two steps, he is now a fully fledged walker, albeit he looks like a slightly crazy, drunk midget, he is a walker none the less. 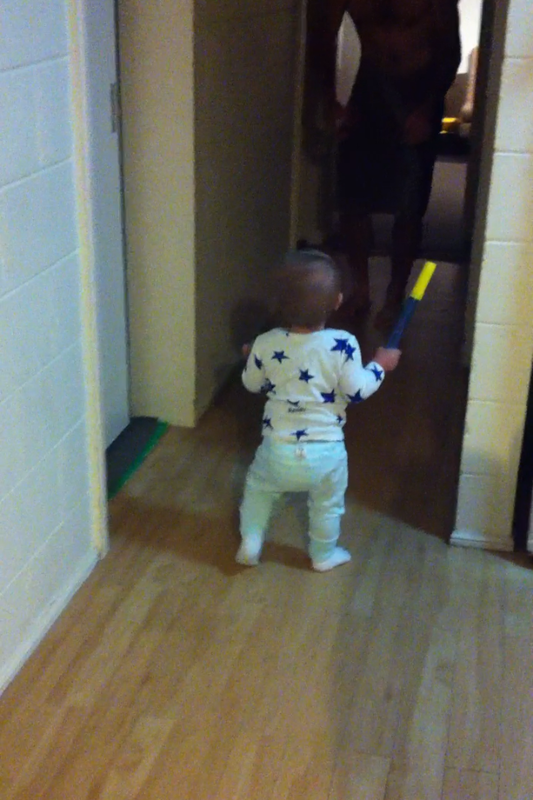 13 months, 1 week and 2 days old and i have a clever little walker man. Well that was easier then i thought it was going to be!! 3 days ago i decided to transition River from formula to cows milk. I actually didn’t even know that’s what you were supposed to do, one of Jamie’s cousins asked me when i was going to transition him over? And i was all like, “ummm, what does that mean?” If it wasn’t for her, who knows how long he’d be on it for, just another thing i didn’t know you were supposed to do. I mean, i guess it’s all personnel preference though. Health professionals say that after 12 months baby can move onto just cows milk, as River’s formula was bloody expensive and he eats like a horse anyway (so he was getting his vitamins and nutrients) i jumped at the chance to wean him off. During the day River man has 2 bottles, 1 before his morning sleep and 1 before his arvo sleep, both are 180ml with 3 scoops of formula. So the first time i gave him cows milk i gave him 100ml water, 80ml cows milk and 2 scoops of formula, he took it like a champ, no worries. For the next bottle i bumped it up to 100ml cows milk, 80ml water and 1 scoop formula. Again, no worries. For his night time bottle he usually has 240ml with 4 scoops, but that night i gave him 200ml of milk, 40ml water and 2 scoops of formula, again he gulped it down. As he took to the cows milk like a pro, the next day i just flagged the formula all together and just gave him straight milk and he didn’t even bat an eyelid, as soon as that bottle hit his lips that was it, gulp, gulp,gulp and it was gone. I had seriously prepared myself for the worst but for once things have been easy! To top it all off the past 3 nights he’s slept right through and last night for the first time in months, i thought i’d try not giving him his dream feed bottle at 10pm and see what happens and do you know what happened? He slept through!! The illusive 7pm till 7am. 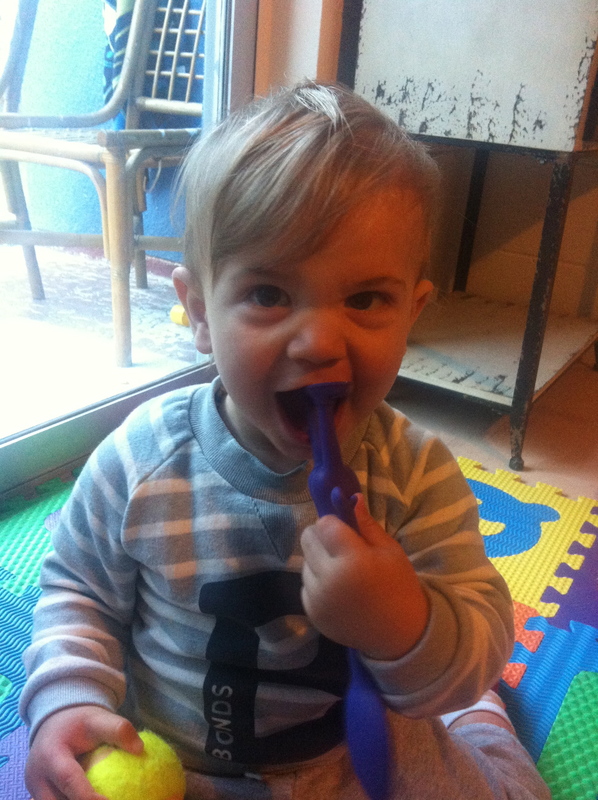 11 months, 1 week and 5 days was the age that River man got his first hair cut! I’d been so reluctant to get little man’s hair cut, i’d held my ground firmly against the persistence of River’s nanny and granny telling me he needed a trim, i just couldn’t bring myself to do it but yesterday as i looked at River with his hair in his eyes i caved in. I was getting a haircut myself, i looked at River, he was blinking and his little Justin Bieber fringe was totally in his eyes, so through gritted teeth i asked the hairdresser if she’d take a little bit off his fringe. She casually said sure, i don’t think she understood the importance of this milestone for me, it may seem really silly but i was super attached to his hair for some reason, like it was a connection to him being a tiny little baby, might sound a little bonkers but it made sense to me. She snipped away and i sat on the edge of my seat, making sure she didn’t take to much off. 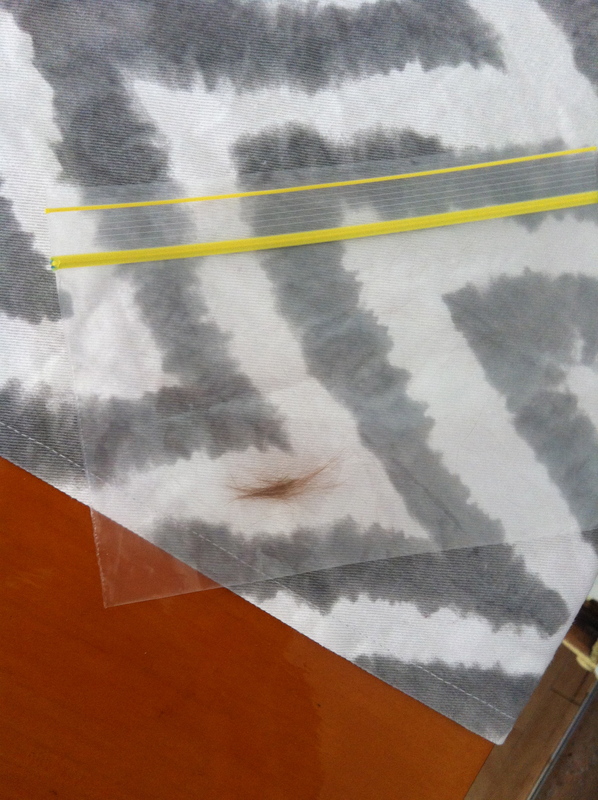 It all went well and she even put the precious, freshly cut baby locks into a zip lock bag for me to keep. It now sits in River’s top draw, another memory tucked away, another little milestone ticked off in the life of River James – West Laidlaw, my love, my life. Maybe, just maybe i’ve cracked the secret sleeping baby code…well for River man anyway. It had been a rough couple of weeks, my partner was away, River had a cold and was waking at least once, sometimes twice through the night and i was just plain old exhausted, what i wouldn’t have done for a full nights sleep. River’s cold started to clear up and i started to see the light at the end of the tunnel, i thought for sure his sleeping would get back to some sort of normality once the pesky cold went away. As you all know though, with babies generally one thing goes away and another road block pops up to screw up their sleep. 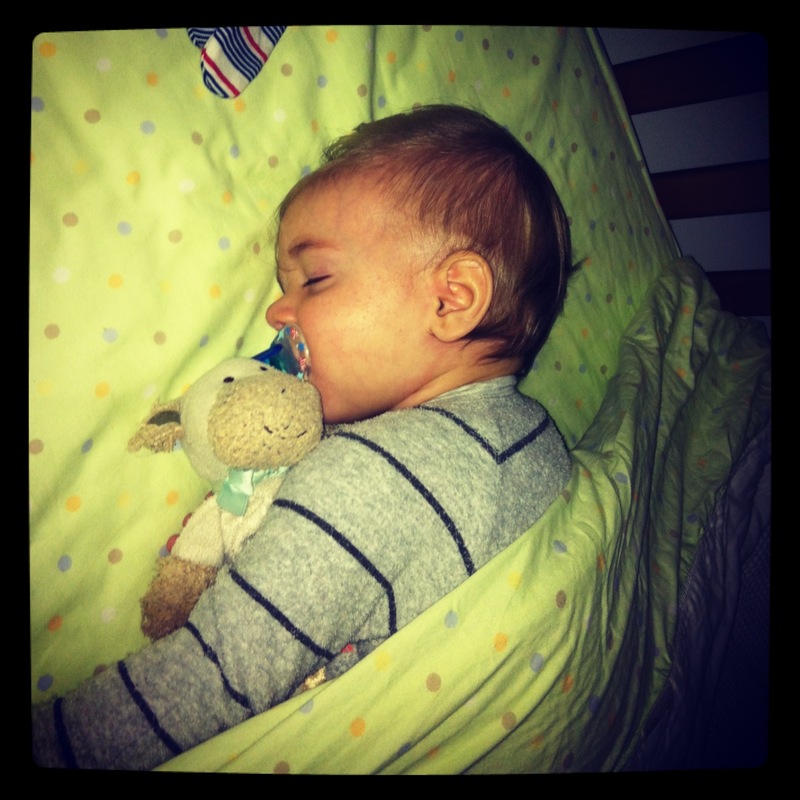 As soon as his cold went away River started wetting through his nappy at night…awesome! There is no better parenting moment then getting up at 3am in the cold to change your screaming babies sheets, clothes and nappy when you, yourself have to get up in a few hours for work, just bliss (note the sarcasm)! It got me searching for answers as to what i could do to prevent this from happening and give me some well needed consecutive hours sleep. 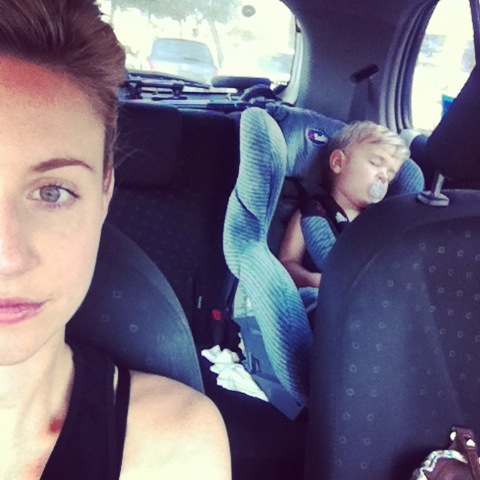 I turned to the mumma’s on my page Love and Late Nights Mumma for some advice. I got a few expected responses like going up a size in nappy and changing his nappy before i went to bed, then i also got a response i’d never really thought of before, and that’s maybe he’s cold. Apparently being cold can cause them to pee more frequently, to me, i didn’t really get it but after going up a size in nappy and River still waking up with an extremely full nappy i thought why not try adding some extra layers, can’t hurt right? So the next night, i put River to bed in his wonder suit, a wonder bundle (which is like a sleeping bag with arms that bonds make), another sleeping bag, a sheet, a blanket and a quilt and then when i went to bed at about 10:30 i changed his nappy, gave him a bottle and then put another light blanket over the top. Drum roll please……HE SLEPT THROUGH THE NIGHT!!!! Not only did he sleep through the night, he hadn’t even moved a muscle when i went it to wake him up at 7, yes i had to wake him up! I thought maybe at first it was probably a fluke but we’re now on night 5 of him sleeping through and every morning i go in and he’s still tucked up under his covers, which for River the wriggler used to be unheard of. Really i don’t know why i didn’t think of the whole cold thing before. I actually wrote a post when River was about 3 months old after some mumma’s suggested the Tizzy Hall bedding guide. The guide is basically how to dress your baby for bed and what bedding to use, after i followed the guide the first time River’s sleep improved greatly. Anywho, River’s sleep is now back to “normal”, i say “normal” because of course my perfect baby sleeps through the night, didn’t you know? Oh, except for when he has an ear infection, a cold, a growth spurt, is hungry, is cold or has wet through his nappy (so basically he sleeps through about 10% of the time) so i guess we’ll see what pops up next time to muck it all up again! 10 months – its not all bad! So i feel like a lot of the time i talk about all the bad things that are happening with my little River man and sometimes neglect to mention all the cool, new, amazing things that he’s been achieving! This month in between throwing tantrums and whinging his head off, River has managed to tick off a few awesome new skills! River can now wave at people it’s so cute and totally melts my heart. I wish i could say i was the first person he waved at but that top honour goes to his dad. It happened at daycare about 3 weeks ago, i went to pick him up and Belinda, the daycare lady said he waved at Jamie this morning. I kinda didn’t believe it, thought it was probably a fluke, then as we were leaving, i said “say goodbye to Belinda” and he waved! Then the next morning as i was saying goodbye he waved at me, it was just the best thing and put a smile on my face all day and now he waves all the time. He claps, well, he’s always sort of clapped but i’m pretty sure he didn’t really know what he was doing, but now he’ll see me clapping and he’ll join in, or a song will come on that he likes and he’ll stand up and start clapping…to cute! He now also high 5’s, well, it’s more of a low 5 but it’s definitely happening, I hold out my hand, say high five and he slaps my hand…awesome! He’s started pointing at things that he wants, if he wants his water he points at it and i give it to him. It’s great, it’s starting to slowly take some of the guess work out of things and each day he’s pointing at more and more things. River now stands up all by himself for long period’s of time. I used to probably get just a few seconds out of him, but now he’ll stand for a good 20-30 seconds and it’s getting longer each day! He’s now also an absolute master at standing up and walking while he holds onto things, i’m sure walking can’t be to far away. As well as the new skills, River has also cracked 2 more teeth, i think they’re called the eye teeth, the 2 right next to his front top teeth. So i guess as i write this, i’m realising just how much he’s been learning over the past month and i guess it’s understandable he’s been so crabby and all over the place, it must be hard work learning all these new things. It’s hard to remember sometimes while they’re screaming their head off or waking up 50 million times a night, just how much must be going on in their little baby heads. It’s a combo, clapping and standing by himself! 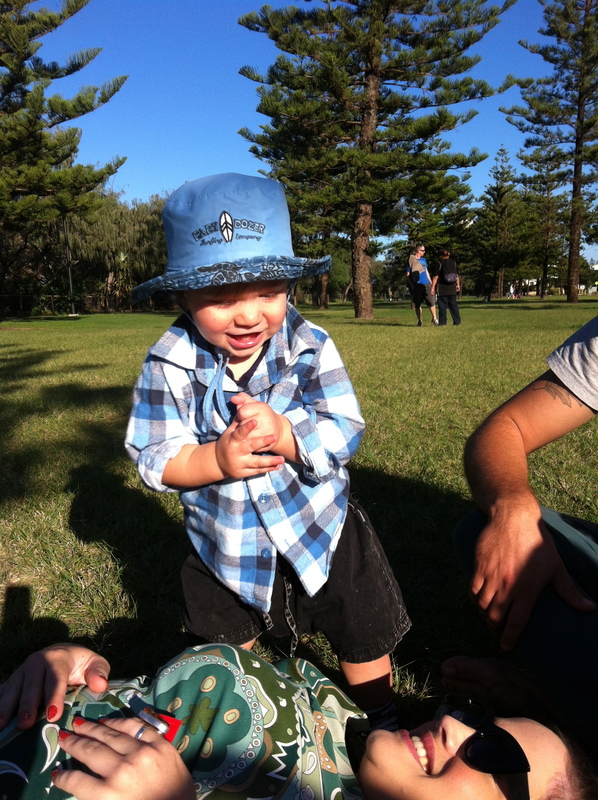 Mr 10 months i am not enjoying you! In about a week and a half River man will turn 11 months, and i have to say it can’t come soon enough, seriously 10 months old has not been fun! In saying that 11 months could be just the same but i’m praying to the baby gods it isn’t! River started sleeping through the night again from about 8 months, it was awesome, then boom, just as River turns 10 months he starts waking through the night again. After nearly 2 weeks of being woken up about every 3hrs (who swapped my 10 month old for a new born?? ), River woke up with a really high temperature. Off to the doc’s we went and sure enough he had an ear infection. He was prescribed drops, as luckily it hadn’t reached his middle ear as yet so he didn’t need antibiotics, but holy hell is it hard putting ear drops into a baby. I literally had to hold his little arms down, while Jamie held his head and tried to put the drops in, he screamed bloody murder every time it was horrible. Thankfully he recovered fairly quickly from the ear infection but just as that cleared up, the teething started, i actually think it probably started around the time he started waking up through the night but it really jumped up a notch around week 2 of being 10 months and he finally cut another 2 teeth through (for a grand total of 6 little toothy pegs). I finally got a bit of relief from the sleepless nights around 5 days ago when River finally started to sleep through again. It started off well and slowly declined again. I got 2 nights of sleeping right through from about 7pm till 7am, then there was 2 nights of sleeping through except waking once at about 10:30pm for a feed then last night he woke up at 10pm and midnight and wouldn’t go back to sleep, i ended up rocking him and after about 4 or 5 failed attempts at putting him down and half an hour or so later, i just gave up and walked out the door, he literally cried for about 2 mins and went to sleep. So judging by the last couple of nights, tonight is going to be fun! It’s already got off to a crappy start with it taking me nearly an hour an a half to get him to sleep. I let him cry for about 15mins before it got to just pure screaming, so i went in, as soon as i picked him up he put his little head on my shoulder and went to sleep. I rocked him for about 5 mins and put him down, as soon as he realised i was putting him down he woke back up and started crying again, so up he went, back on my shoulder. The kid must be pushing at least 12kg’s these days and oh my god by arms were killing me, but every time i went to sit down he would start to cry, seriously child, what’s the difference between sitting and standing besides mummy’s dead arm! We did this back and forth dance for a while and eventually (after me losing my cool a little) he went to sleep. I am absolutely dreading what tonight’s going to bring because as well as being sleep deprived i also have a hideous cold…aghhh! Oh and to top the whole 10 moths old thing off nicely, River has now perfected his tantrum throwing. He arches his back, shakes his head back and forth and kicks and screams, it’s absolutely glorious and not at all embarrassing (note the sarcasm). I just really didn’t know that i would be in for tantrums so early on in my parenting career, i thought i at least had the first year tantrum free with a somewhat perfect angel child…bahaha very funny! Today he got himself so worked up because i took him away from the dirty bin (i know i’m such a terrible mum) that he just lay on the ground kicking and screaming. I’m actually finding it quite difficult to deal with, i feel as though it’s my fault he’s behaving the way he is, i mean, deep down in my heart of hearts i know he’s only 11 months old and it’s probably just him just testing out his new found emotions and feelings but i do hope he sorts them out an calms down soon. I think my worst nightmare being a parent, is being the mum of the “naughty kid” at daycare or school. All i want for River is for him to be a good kid, have manners, be compasionate and be respectful of everyone and evrything around him, i’m going to try my hardest to make this happen and lead by example. So to round it up, 10 months has brought me countless sleepless nights, ear infections, crazy tantrums, lots of whinging and whining, teething and a cold. Oh dear baby gods (if there is such a thing) please bring back the easy, breezy child of months gone by, make the last month leading up to River turning the big one just a little bit easier, i don’t want much, maybe just halve the tantrums a bit, chuck in a few more sleep filled nights and you can hold the ear infections and colds. 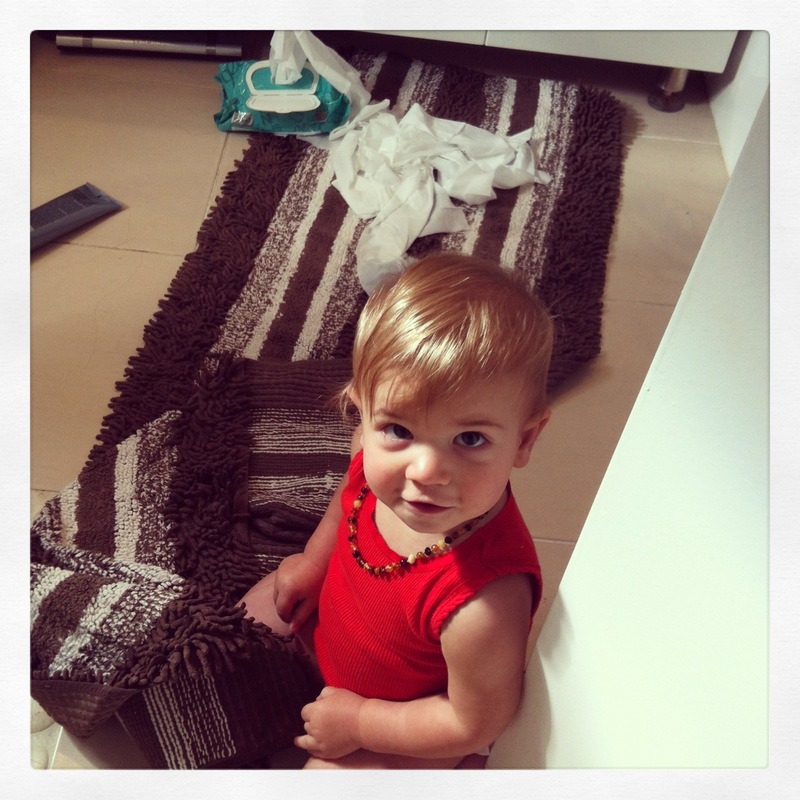 I’m hopeful for the future…come on 11 months old, you can’t be any worse (i know i’m going to regret saying that). Welcome to Love and Late Nights Mumma, a blog which takes an honest look at the good, the bad and the ugly of motherhood all through the eyes of a brand new mum.